Personal TV's are becoming more and more common on airplanes, great news for most, but an annoyance for some. Let me explain. 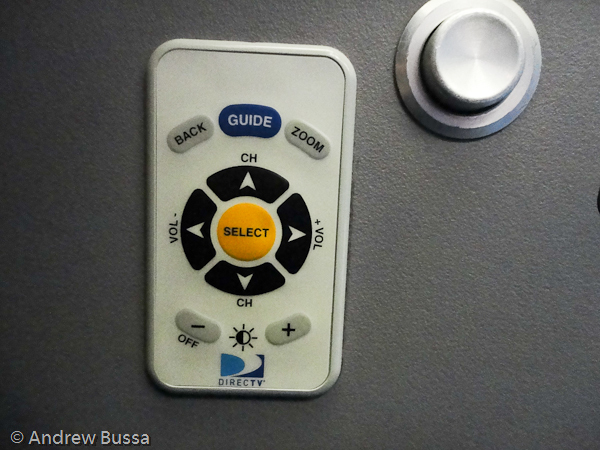 United / Continental has personal TVs in most of their 737 fleet and charge coach passengers $4 (flights less than 2 hours) or $6 (flights greater than 2 hours) for the service. Some people who don't buy want to turn them off and sleep. Most people do this by pushing and holding the OFF button, lower left in the picture (it also adjusts the brightness). Some people on my last flight didn't know about that button and tried to cover the screen up with airsick bags, notebook paper, or safety cards. Others were staring at a Lincoln car commercial run in a loop for three hours. There is an easier way.